What are the Bottarga fish roe? Let’s get to know the fish roe that will make you look differently at your food-the Bottarga roe! Almost everyone knows one major type of fish roe, caviar for example. However, it is important to know that these days there is a wide variety of fish roe such as Bottarga. What are the Bottarga? Are these fish roe similar to caviar? Why does this type of fish roe look like sausages, rather than a batch of roe? The Bottarga are fish roe known by their nickname “the caviar of the poor”. Unlike caviar, which are fish roe that are more common in Northern Europe, the Bottarga are fish roe that are more common in the Mediterranean. In principle, it is an Arab sort of food that is common mainly in Northern Africa, and is named differently around the world. Bottarga is actually the European name for these fish roe. But was is their taste, and how can they be served? It makes sense to know! The Bottarga fish roe go through a very special process, where they get salted heavily and coated with wax, until they get the shape of a sausage more than a shape of roe. The sausage shape of these fish roes, gives them the ability to be served in many variations. Today it is customary to serve them in different events, because they are wonderful as an appetizer by itself, but also as an addition to bread or a toasted bun. Another advantage is their price, the Bottarga are not as cheap in Israel as they are in North Africa, nevertheless, they are cheaper than other types of fish roe such as caviar. It is possible to combine these fish roe with popular types of alcohol such as Arak or Ouzo. Another option, which is more popular in Europe, is to eat fish roe as an addition to pasta. In restaurants in Israel the Bottarga is served as an appetizer on its own, with a special strong taste. Today there are special recipes for these fish roe, which even offer you to prepare Bottarga spread or Bottarga butter. It is important to point out, that the relatively low prices of the fish roe, is a result of the prices of the material. 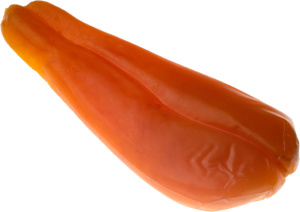 The Bottarga fish roe, are ready for production from roe of common fish in the Mediterranean such as Tuna and the Mullet. This fact enables the fisherman to collect a large quantity of fish roe, and this way their prices are a lot cheaper. In different stores and events, where you can almost always find Bottarga fish roe ready and rolled in the shape of a sausage and coated with wax-because that is the traditional way of serving. It is important to note, that if you find fish roe of the fish we have mentioned-it is not Bottarga, because it is not the common way of serving.